As I said earlier this week, most of the unpacking into the new home is done! Now I can get to really decorating for the seasons and holidays. You may remember my mantle decor at our previous house. The mantle there was like no other, making it difficult to decorate. my new spaces to decorate for Fall! Fall decor but that's okay. I buy thriftly and find what I love and just use it differently. Such as the Autumn banner I made last year. It fits across the new fireplace perfectly! The wall color of this house are perfect for Fall! without being "In Yer Face"
I was a bit worried that I wouldn't be able to figure out how to decorate the shelf over the TV. I wanted to be sure it looked good, front and back. I think I found the right combination of decor to pull it off. 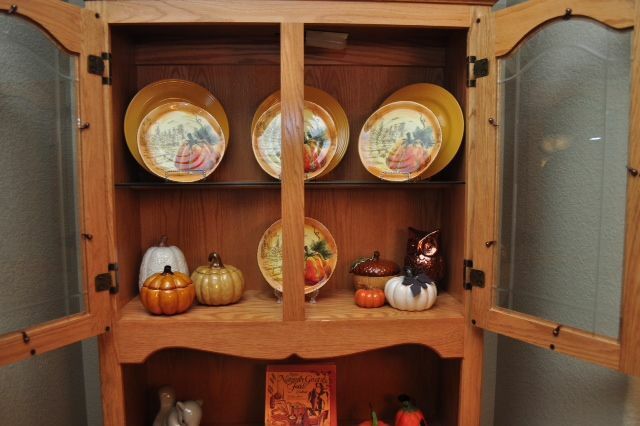 Of course I had to make sure that, just because my china hutch now sits in a cubby in the dining room, it doesn't get neglected. Nor could I leave the buffet unadorned. I had SOOOO much fun setting up our new home for Fall! Mr. B's parents are visiting this weekend for Canadian Thanksgiving dinner and I cannot wait to show off our pretty new house. be sure to come back by to see that too. Wow you did a wonderful job with your fall decorating! I bet it's fun to view these new spaces and decorate them for the first time! 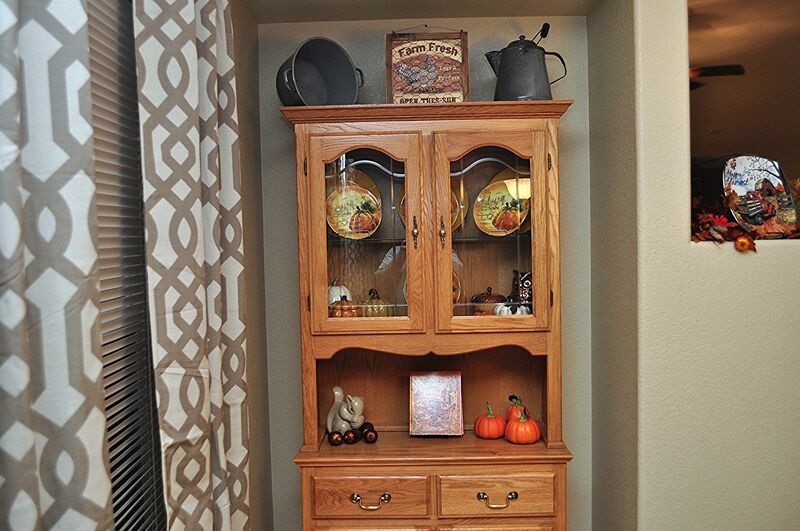 Love the china cabinet- it looks great in its cubby too. 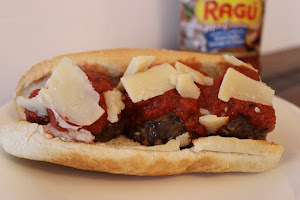 Your in-laws will love it! It looks beautiful. Nice and "fall-esque" without being over the top! Love it! I like the niche above the mantel. A fun spot to decorate. Great place for the clock too! Kathe it looks fabulous! It's seems your stuff was just made for this house! 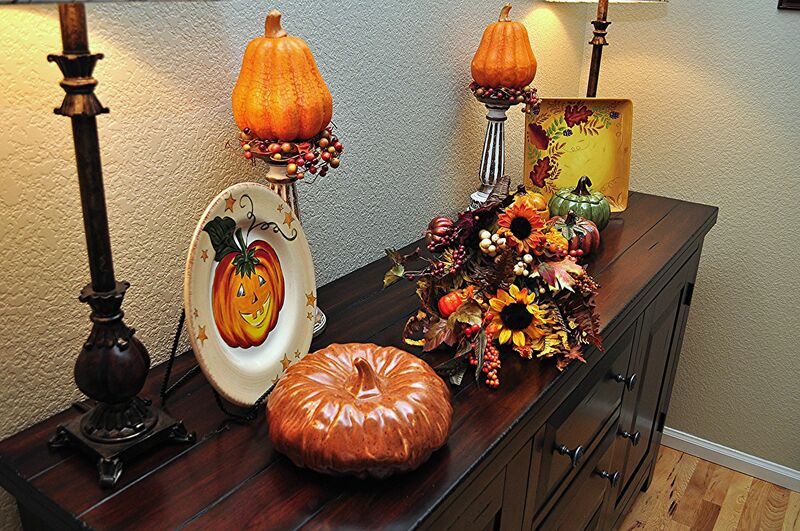 Love all your fabulous fall decor, Kathe. Everything looks so festive. Thanksgiving must be a real treat! Congratulations on your lovely new home! And your fall decorations are just fab! 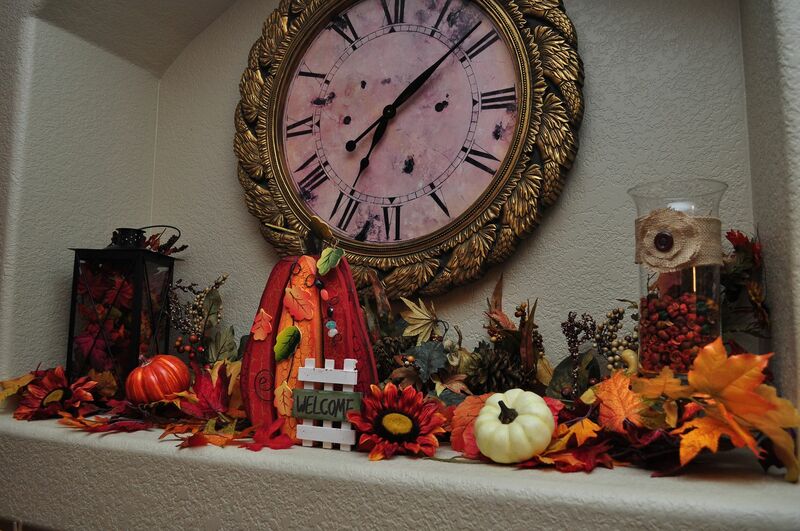 The Mantel and all other decorations as just lovely. I just know you are having so much fun with the new house. Everything looks beautiful, Kathe! 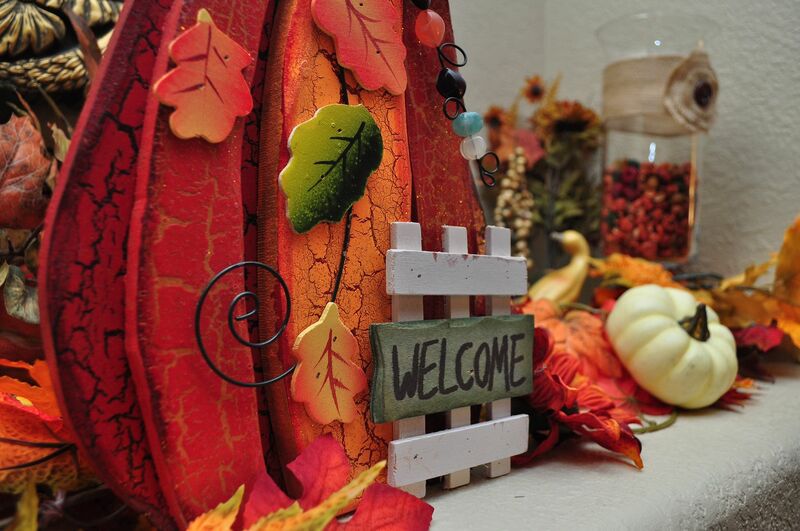 Perfect for your first fall season in your new home. Cute! Cute! Wish I had the energy to decorate. I love going into a house that's decorated for the season, but I never do it myself. Lazy. LOL! Love your beautiful décor. You really conquered those built-in nooks which can be difficult. Beautiful plates on the buffet! I LOVE the banner!! and your home looks lovely! Great job! Love it all Kathe! Looks like you have settled in nicely. Very lovely home! You have some lovely ideas! I think Autumn is my favourite season to decorate for. Thanks for sharing! Love it! It looks so cozy! It looks so festive! How fun to decorate all those brand new spaces! I love fall decor so much and this piece of article is superb. 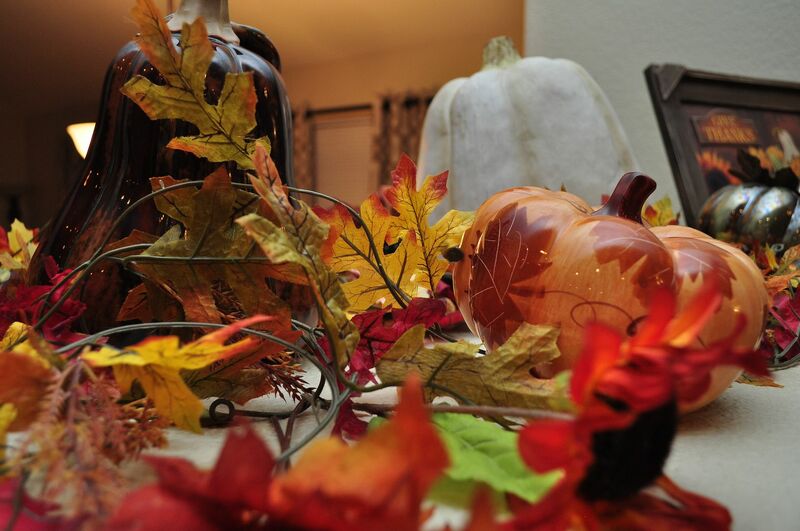 The pictures you have shared of fall decor in this post are amazing. Oh wow, all of your fall decorations are gorgeous. 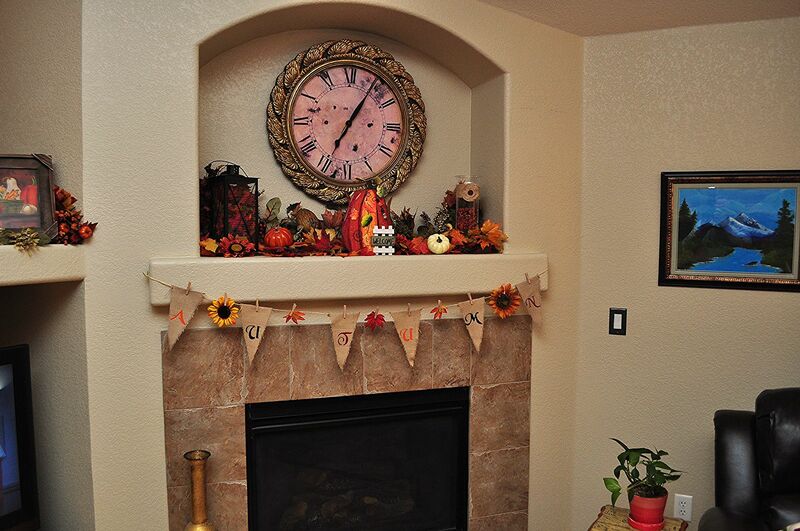 I especially love the mantel and all the cute fall decor on it. 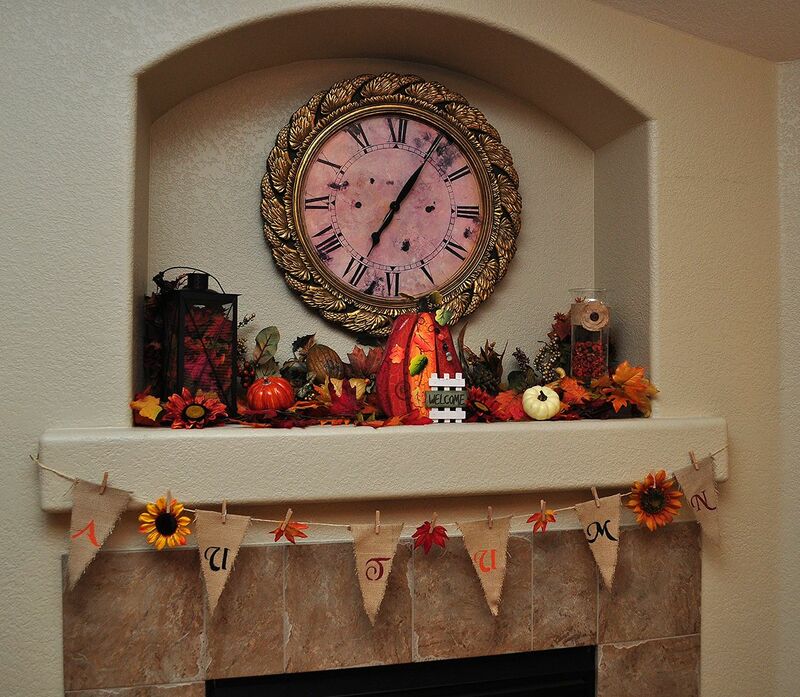 The banner is SO cute and that clock looks so perfect with the fall colors. 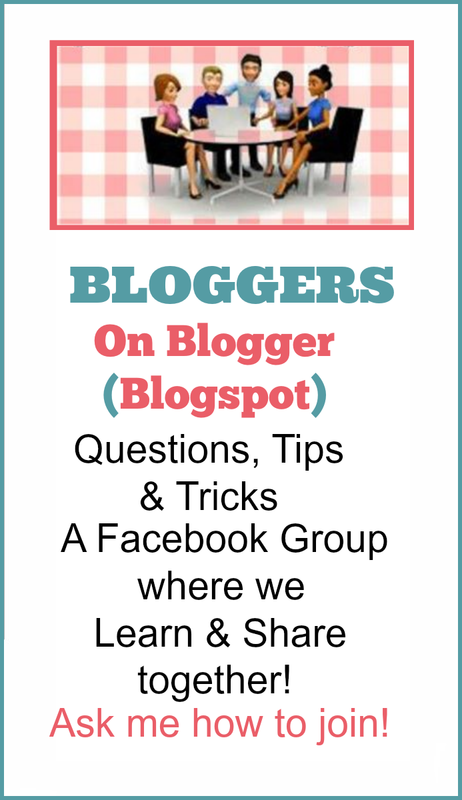 Thanks for sharing and for linking up to Thrifty Thursday. Fall is my favorite time of year, but I don't do a lot of seasonal decorating- just too lazy. All of yours looks wonderful. 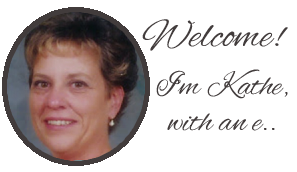 I love the banner, and your 2-sided shelf area looks great- a tricky spot for sure, but you pulled it off. How wonderful to have a beautiful new home to decorate. 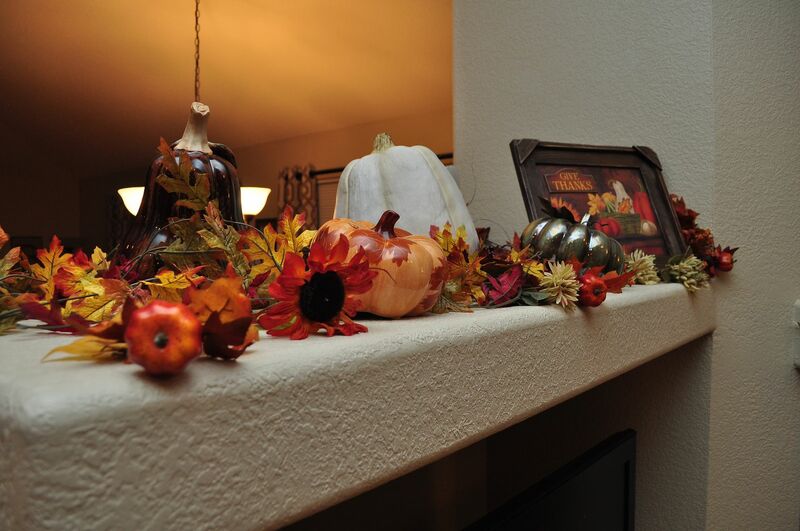 Your mantle is the perfect for your pretty fall banner. I love how you used the shelf over the tv to decorate for both sides. Hope you enjoy your husband's family visit and Canada's thanksgiving. Have a great week! The first time decorating for a holiday or season is always the most exciting. New houses are so fun. Everything looks so wonderful, Kathe! You did a great job with the mantel and the shelf that's visible from both sides. Isn't it just so much fun decorating a new home? We've been in our home for two years, but it's still so much fun to decorate. Enjoy your company and Happy Thanksgiving! Oh I know that you are having a super fun time in your new home. 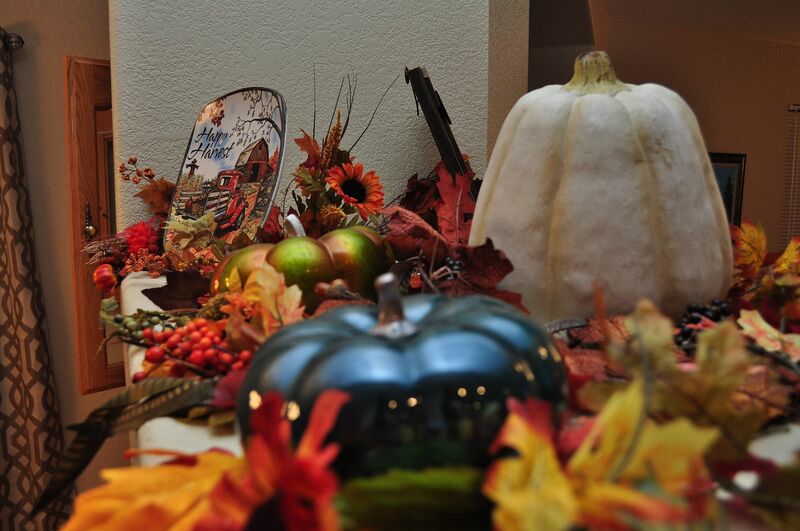 Great Fall displays Kathe! Thanks for sharing with SYC. Beautiful. What inspiration! I love how you have decorated your new home. 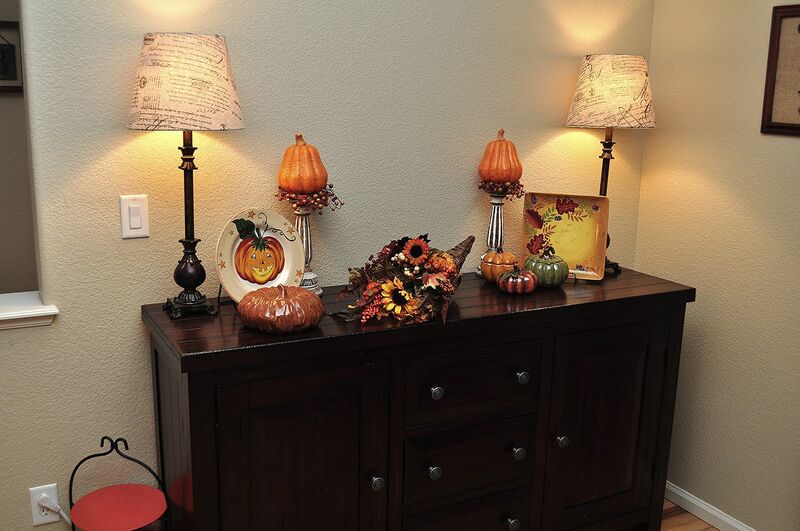 GORGEOUS Fall decor Kathe! Looks like you've settled into your new house well! Gorgeous decor! I love the little banner you made too. Your new home is lovely and ready for the cooler weather! Your fall decorations are so warm and inviting. Have a great weekend! 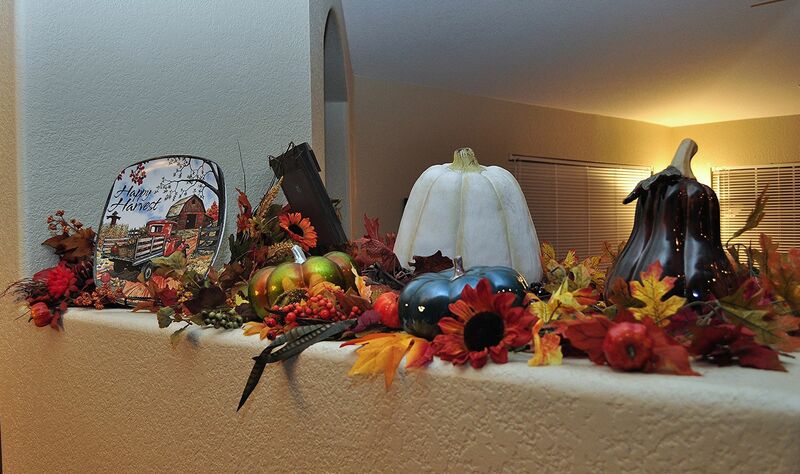 How fun to be able to decorate your new home for the season, Kathe! 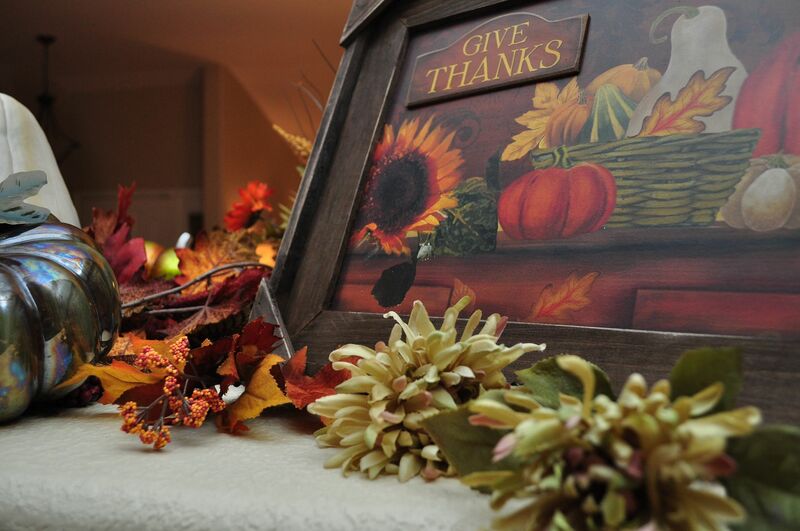 Your fall decor is beautiful and everything complements everything else just perfectly. 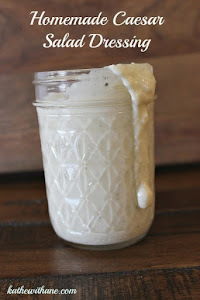 Thanks so much for linking up over at Moonlight & Mason Jars! 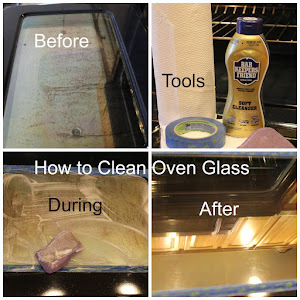 I had fun guest hosting this week, and I've enjoyed visiting all of the great posts. Hope you have a wonderful weekend!